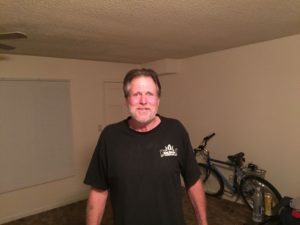 The Grover Beach Police Department has identified the man whom officers shot and killed last week as Kenneth Alan Eustace, 58. An obituary published by a Grover Beach funeral home states Eustace suffered brain trauma earlier this year. Likewise, the police department has released the names of the two officers involved in the shooting. They are Sgt. Juan Leon, an 18-year veteran of the Grover Beach force, and officer Matthew Monteiro, who has been with the police department for 17 months. Leon and Monteiro arrived at a home in the 1000 block of Brighton Avenue on the night of July 12, in response to a call made by a woman whom Eustace was trying to ask out. When the officers arrived, they found Eustace armed with a blunt object in front of the home, police said. Police have still yet to reveal what the object was. The policemen then deployed a Taser, but it had no effect on the suspect. Eustace continued to threaten the officers and charged toward them with the weapon in a threatening manner, police said. The officers then shot him. A woman who identified herself as Maribella, said Eustace repeatedly tried asking her out prior to the shooting. Maribella told him she was not ready to have a relationship. Eustace was then calling, “Maribella, open the doors,” she said. At one point, Maribella opened the door, but her roommates immediately closed it. After the roommates shut the door on Eustace, he got mad and started hitting things, Maribella said. “There are times when something happens that seems random and unjustified by events that passed only a brief time before,” the obituary states. A Grover Beach police investigation is ongoing. Both officers involved in the shooting remain on paid administrative leave pending an investigation by the San Luis Obispo County District Attorney’s Office. Ah well much is explained by the naming of Sergeant Leon. He testified today in the dog mauling case, and this guy is a PIECE OF WORK. If I were a Grover Beach resident, I would make damn sure this case is THOROUGHLY investigated by Sergeant Leon is the epitome of an unprofessional cop. I’d like to know what sort of “blunt object” Mr. Eustace was armed with? This was a 2:1 situation. I’m sure they both had nightsticks. Does law enforcement ever put themselves in harm’s away anymore by wading in and physically taking someone down, or do they just shoot these days? There are still some missing facts; exactly what exactly was the blunt object? Was it a baseball bat or what? The victim looks of average size & build and I don’t know why two armed cops (batons & pistols) can’t use tactics short of “shoot to kill” to disarm and take the victim into custody. How about one cop using a baton from the rear while the other occupies the victim from the front or how about shots to the legs or shoulder? I know that cops have a dangerous job and there are many “bad guys” out there along with unprovoked attacks on cops. But I also know that in recent years there has been an increase in the use of deadly force while making arrests, often with two or more cops on the scene. Police leadership needs to carefully examine the training of cops and dare I say minimum physical requirements for the job. A nine milliliter should not be used to augment physical inadequacies. We really need to stop this whole “paid administrative leave pending an investigation”, we need to have them still go into the station/office on their regular schedule and dressed as normal and if nothing else just sit at a desk, a taxpayer funded vacation they certainly shouldn’t be getting. I’d prefer they do paperwork or filing, I’m sure there is something they could do with being out in public but I’m sure the union wouldn’t allow that, just have them sit at a desk, then again I’m sure the union would scream about that too. I have a co-worker who doesn’t like cops, I asked why? He replied that they need regular psycho therapy due to their constant exposure to the dangerous us, thence for some, they can become a threat to us. I believe that he has a point but to error on the safe side, doing what you told by law enforcement is the safest bet. Do what you’re told. That’s good advice for the rationale. Problem is a lot of these guys they confront aren’t rationale. But I don’t think that makes them fair game, do you? If someone doesn’t comply right away–what’s the rush? Can’t they contain, call in back up, then work towards complying? Too often merely failing to obey commands is the license to escalate physically. Get numbers on your side, then push for compliance. Often the officers perception of “fear” becomes the overarching construct for the appropriateness of their behavior. Logically speaking; more officers equals less perceived fear by the individual officer. So as a matter of policy why not wait until compliance can be had without physicality? Wait for back-up. It sure would be nice of the police dept. to let us all know what the blunt object was that caused the officers to react in the manner that they did. Continuing to refer to it only as a “blunt” object at this point appears to be purposefully vague. And for what reason? It is a proven fact that where there is a large number of LEO’s involved with trying to verbally subdue a suspect there is a better chance force will have to be used, up to and including deadly force. This especially true where there is a suspect with mental incapacities. The overriding factor in this? Confusion! Where there is a large LEO presence there is generally more than one command being given to the suspect; you can have one LEO telling the suspect to lie down and another telling him or her not to move while yet another is commanding something else. In extreme cases this is done purposely so LEO’s are “justified” in using force. I have personal experience and have been in a small room where there were a large number of LEO’s on the other side of the door giving conflicting orders and when my crime partner went to open the door as commanded by one of them another kicked the door in a shot my at my crime partner because he wasn’t on the floor as he had commanded. What the real problem is, and I’m not blaming any LEO for this, there is no real meaningful training for LEO’s on how to recognize let alone deal with a person like Mr. Eustace.